When you stay at AKZENT Hotel Forellenhof Rössle in Lichtenstein, you'll be on a river and 8 minutes by car from Lichtenstein Castle. Featured amenities include complimentary newspapers in the lobby, dry cleaning/laundry services, and multilingual staff. This hotel has 4 meeting rooms available for events. Free self parking is available onsite. When you a stay at Hotel EDEN in Ostseebad Baabe, you'll be near the beach, just steps from Ruegen and Southeast Ruegen Biosphere Reserve. The front desk is staffed during limited hours. 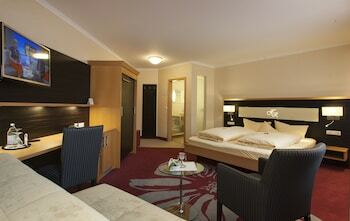 With a stay at Aparthotel 1A in Zwickau, you'll be within a 10-minute walk of St. Marien Cathedral and Priest's House. Free self parking is available onsite.